Authorities say that speed may have been a factor in the death of 43-year-old Mark Alling, of Phoenix, when he crashed his vehicle near a Prescott Fire Department station on March 26. If you or someone you love has been hurt by a speeding driver in Phoenix, you have legal options. The car accident lawyers at Phillips Law Group can help you and your family recover from the harm you suffered. According to authorities, Allings car began rolling over at Williamson Valley Road and Yakashba Drive for reasons that are yet unknown. Prescott police believe speed was a factor but have not yet revealed why the car began to roll in the first place. Lt. Amy Bonney, of the Prescott Police Department, said that Alling was pronounced dead at the scene. His passenger, a 44-year-old man from Massachusetts, was flown to a local hospital for treatment and was said to be in stable condition by Friday. Phillips Law Group sends our most heartfelt condolences to the family of both men. As more details become available we will update this story. Speeding is routinely cited as one of the most common causes of an auto accident. Driving too fast for conditions not only diminishes the time a driver has to react to a change in their environment, but it also increases the force of an impact, which in turn can heighten the physical damage done to a vehicle or a human occupant. Victims of car accidents where speeding was a factor often suffer debilitating injuries like deep lacerations, amputated limbs, facial disfiguration, and more. 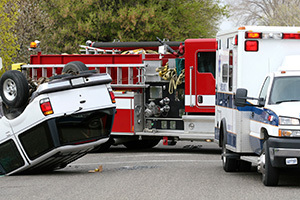 Speeding accidents are a main cause of car accident fatalities, as well. Contact our Phoenix personal injury attorneys today to receive your FREE case consultation. Call or text 1-800-706-3000 or fill out our free online case review form to get help today.